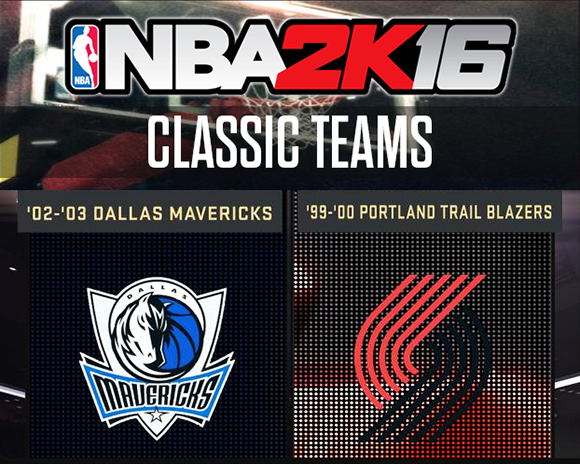 2K Sports has announced that the 2002-2003 Dallas Mavericks and 1999-2000 Trail Blazers are coming to NBA 2K16. There will be 12 new classic teams added this year, 5 of them have now been confirmed. As previously revealed on NBA 2KTV, the 2000-2001 Los Angeles Lakers, 1999-2000 Toronto Raptors and 2007-2008 Boston Celtics are included among the 12 new classic teams in the game. 2K will reveal new teams every Thursday. Which classic NBA teams would you like to see this year in NBA 2K16? Let us know in the comment section below. NBA 2K16 launches on September 29, 2015 for Xbox One, PlayStation 4, Xbox 360, PlayStation 3 and Windows PC.